While it has been some time since we’ve written an update on our blog, TripSit itself has by no means been dormant! In this post, I hope to give an overview of a few major updates we’ve been working on, and an idea of what you can expect from us as 2018 continues. We also post more frequent updates on Twitter and Facebook. Towards the end of the last year, we were invited to present at several harm reduction conferences in Europe, through which we were excited to find that many harm reduction organisations are actively using our resources. We had many productive discussions with these organisations, and hope to work with them more closely in future. To build on this network, we’re currently trying to compile a list of harm reduction organisations using our resources, or who are interested in working with us. In doing this, we can more easily gain feedback and maintain closer relationships with those relying on our services. For this purpose, we’ve placed several adverts around our websites, but if you work for such an organisation, you can let us know about you here. We have also put a lot of work into improving our online services, publishing two new harm reduction tools and making a major update to our factsheets service. We’ve created a DXM calculator, inspired by the now defunct tool that used to be available on DarkRidge. This page allows users to easily calculate their DXM doses based on various preparations of DXM-containing medicines, and their weight. Over the coming weeks, we will be expanding this service to include a greater variety of products, and then add harm reduction information concerning dangerous and undesirable additives. Our other new tool provides a calculator for dosage equivalencies between benzodiazepine drugs. This is possible because the strength of most benzos are measured in terms of their potency in relation to the ‘gold-standard’ of 10mg diazepam. While the base calculator is now finished, work will continue to provide coverage for a greater number of benzodiazepine drugs, and to provide additional advice based on the differing properties of the various drugs in the class: their tendency towards hypnosis, analgesia, anxiolysis, etc. We’ve also recently rolled out changes to our online chat system, making it easier for people to get help and to improve the general user experience. Most obviously, our web client received a major update, primarily visible through its entirely redesigned user interface. We’d like to thank prawnsalad and the other developers working on Kiwiirc for their stellar software, which helps support what we do. After being asked many times by willing potential volunteers how to get involved with tripsitting, we decided to streamline the process. Now, when browsing to our chat page, you can see a ‘Here to Help’ button, which will allow you to drop into the support channels in a supporting role. We have also made a few load-bearing changes to our assistance infrastructure – provisioning more channels, and balancing users between them. These changes were prompted by a large influx of users following coverage of our network from a popular YouTube personality. While these initially presented a challenge for the community both in dealing with the increased load from legitimate users and trolls, it allowed us to develop a more robust and scalable tripsitting service, able to better serve a larger amount of people concurrently as we grow. In the coming months, we hope to continue developing our existing resources and finding opportunities for realising new ideas. We’re hoping to place a particular focus, this year, on forging relationships with other harm reduction organisations, and investigating how we can all work together to improve continuity of care, and to provide a more cohesive harm reduction infrastructure worldwide. 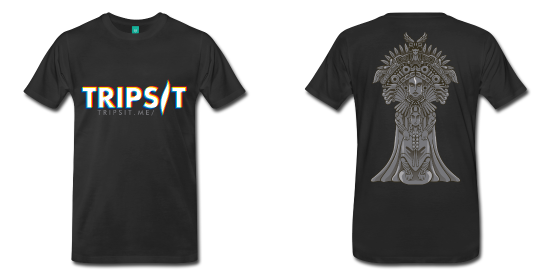 Help show your appreciation for TripSit by purchasing a shirt to assist funding future projects and services!